Jake Thompson, Philadelphia’s top pitching prospect, made his MLB debut Saturday and the only reason it was memorable was because he became the 2,000th player to appear in a game for the Phillies. You can never take that away from the kid, but we’re sure he’s ready to forget the other numbers: 4 1/3 IP, seven hits, six earned runs, two walks and one strikeout (see video below) in a loss in San Diego. Perhaps Thompson will have better luck at home on Saturday against Colorado. He’s armed with a very nice fastball and a solid slider that projects to be even better in time. Thompson’s command, however, could use some work. This young righty projects to throw more strikes as he gains consistency, but there’s going to be some bumps in the road, so it’s hard to envision him as a Fantasy asset in the short term. Still, when looking at his record and ERA at Triple-A (11-5, 2.50), it’s hard not to get excited, but a closer examination reveals the flaws: an FIP of over 3.75 and a very middling K rate (6.04/9). If Thompson can limit the walks in the bigs, he’ll have a chance to be successful. After all, there’s a reason we slotted him in the top 40 in our Top 75 Prospects Rankings. Still with the Phillies, wow, has Cody Asche’s career ever gone downhill the past couple of years. Two years ago, at the age of 24, Asche was most similar (according to the Similarity Scores at BaseballReference.com) to Jack Lohrke, an infielder that wound up spending seven seasons in the bigs in the 1940s and 1950s, accumulating 354 games and 1,046 at-bats with very little power. Two years ago, Asche had established himself as a more or less full-time big leaguer, improving his hitting to the point it was respectable while flashing some developing power (25 doubles, 10 homers). Last year, he saw more action, and while he slightly upped his slugging, his BA dipped a tad. It was good enough for us to slot him 116th in our Rest of Season Outfield Rankings. This year has been a write-off for Asche. He began the season on the DL with an oblique strain and was out until June. Asche is currently on the strong side of a platoon in left field with Tyler Goeddel, but Asche was so rancid in July (510 OPS) and so far in August (357) that it seems just a matter of time before he loses his starting role. 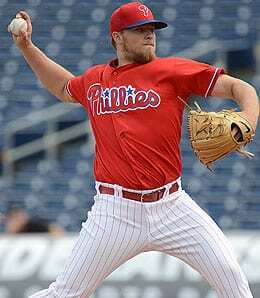 Feel free to dump Asche in all formats. You’re better off looking at Paulo Orlando or Keon Broxton should you need an outfieldfer in a very deep format. The fact of the matter is, we liked Asche a lot more as a third baseman, but then he lost his job to Maikel Franco and was shifted to LF. And with more outfield prospects on the way, Asche’s role as a big leaguer could be in doubt very, very soon. Now it’s your turn. Let us know in the comments below how you think Thompson will do in his second start. This entry was posted on Thursday, August 11th, 2016 at 2:48 pm	and is filed under BASEBALL, Fantasy Notes, RotoRob. You can follow any responses to this entry through the RSS 2.0 feed. Both comments and pings are currently closed.